(Bloomberg) -- From international bankers to Kurdish politicians, Turkish President Recep Tayyip Erdogan is finding plenty of enemies as economic troubles bedevil his campaign for local elections seen as a referendum on his rule. Faced with Friday’s biggest slump in the lira since last summer, and opinion polls indicating his ruling AK Party might lose its long-held control of the capital, Ankara, in the March 31 municipal ballot, the president is risking market credibility and diplomatic rifts to rally support. On Sunday, Erdogan started by warning those “soaking up foreign currencies from the market and engaging in provocative actions” that they would pay a heavy price. The threat made at a rally in Istanbul came a day after Turkish regulators began investigating JPMorgan Chase & Co., two of whose analysts had suggested selling the lira, and other unspecified banks. The Turkish president then accused more than 300 election candidates of having links to separatist Kurdish PKK militants, threatening to remove those who win from office as he did after a 2015 ballot that temporarily ended his Islamist-rooted AK Party’s parliamentary majority. Erdogan has almost untrammeled executive power following a double victory in 2018 parliamentary and presidential elections. His nationalist alliance is set to get more votes than any other bloc but all eyes will be on whether his support falls from last year when he won the presidency with 53 percent of the ballot, and whether his party wins races in totemic cities such as Istanbul and Ankara. 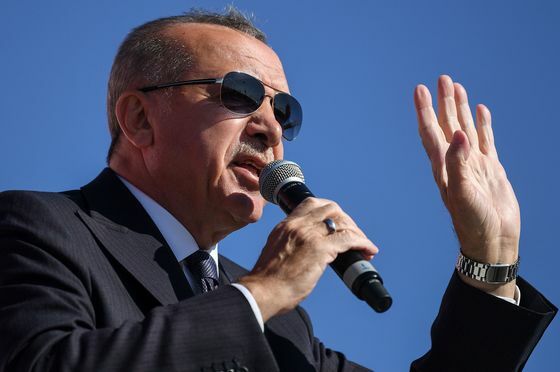 A significant loss of votes this weekend would be “deeply troubling for the AKP leader as it would invalidate his appearance of being popular and invincible,” according to Teneo Intelligence Co-President Wolfango Piccoli. The lira rebounded on Monday after central bank action, but Turks will vote against a grim economic backdrop. The country is in its first recession for a decade, unemployment is at a nine-year high and food stalls are selling discounted goods to insulate the poor from the impact of last year’s currency crash. That was triggered by U.S. sanctions imposed amid a diplomatic standoff, and a repeat is possible with NATO-member Turkey pledging to proceed with the purchase of a Russian S-400 missile-defense system over American objections. Denouncing what he says is growing prejudice against Islam, Erdogan has upset Wellington and Canberra by showing rallies some of the footage recorded by the Australian white supremacist who killed 50 people this month at two Christchurch mosques, including a “manifesto” that mentioned the minarets of Istanbul’s famed Hagia Sophia. Soon after the attack, he ruled out calls from his supporters to allow Muslims to worship at the building -- originally a Byzantine church, then an Ottoman-era mosque and now a museum -- saying doing so would put mosques around the world at risk. 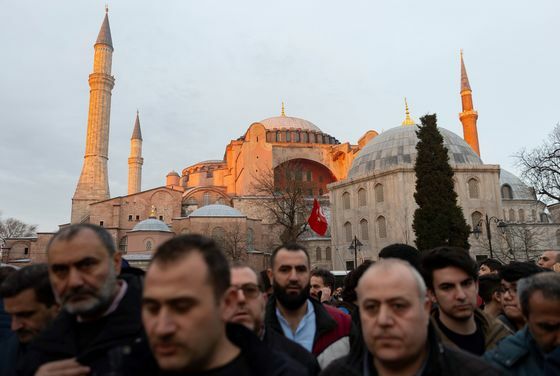 But on Sunday, Erdogan proposed a halfway measure that would rename it the “Mosque of Hagia Sophia” and allow people to visit without paying an entrance fee. Campaigning has been especially fierce in Ankara, where Erdogan has lashed out at the man tipped to win -- Mansur Yavas of the Republican People’s Party. He’s been fielded by an opposition bloc that’s supported by the pro-Kurdish HDP and has a double-digit lead in some pre-election polling. Since 2015 Erdogan has sought to conflate the HDP with the militant separatist PKK, leading to a broad crackdown on its leadership and the eviction of about a hundred local party mayors. The PKK is designated a terrorist group by Turkey, the U.S. and EU. This year, the HDP is sitting out races outside its southeast stronghold and reached an agreement to back the main opposition grouping. On Sunday, Erdogan said the arrangement was a ruse in which Kurdish candidates were running on the tickets of other parties.